PC storage is always a balancing act of price, capacity and speed. 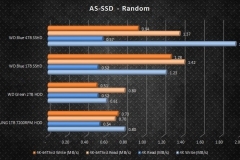 Western Digital’s Blue 4TB SSHD provides a healthy compromise and is worth a look. Solid State storage is the way of the future and the cost per gigabyte is dropping with every new wave of SSD technology. At this point in time, the price/gigabyte is not yet low enough for gamers and enthusiasts to turn our backs on the old faithful mechanical hard drive. Photos and videos are higher definition and increasing in file size, game libraries are also getting bigger and thanks to Steam sales, so are the number of titles that we need/want to store locally. There is simply too much data to be held in a cost effective way by current SSD solutions. On top of that, building a PC on a budget sometimes means a balancing act with regards to performance components. The WD Blue 4TB SSHD is pitched as being suitable as a boot/system drive due to the 8GB NAND cache that uses proprietary logic to determine the disk blocks that are frequently used and keeps the contents in the cache for faster access. What’s even better is that the whole process is invisible to the user – you just use it like any other drive. 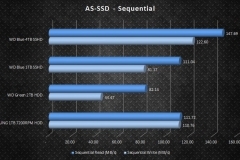 The WD Blue SSHD comes in 2 variants, a 4TB 3.5″ and a 1TB 2.5″. To look at these, they look just like any other mechanical hard drive. Windows recognises them in the same way and for all intents and purposes, they are the same in their function. It’s what goes on behind the scenes that makes the difference. One of the things that surprised me about these SSHDs was that they are 5400rpm. I was expecting at least the 3.5″ version to be 7200 rpm given that my 500GB Blue WD drives in the spare parts cupboard were 7200rpm. There are benefits to lower spindle speeds – such as less vibration, less chance of resonance within the case, lower operating temperatures and usually less power. 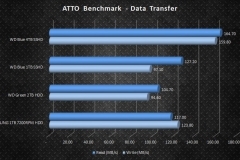 But typically less rpm on the spindle means lower data transfer speeds – enter the NAND cache. 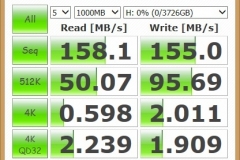 WD boasts ‘SSD-like’ performance and when I tested the 4TB as a boot drive initially and indeed it was pretty quick to boot after a few days of use. 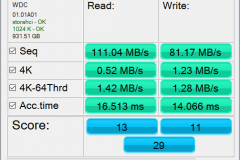 Based on the boot speeds and general feel of the system when I used the Blue 4TB as a system drive, I’d say that the algorithm for caching to the NAND does its job. 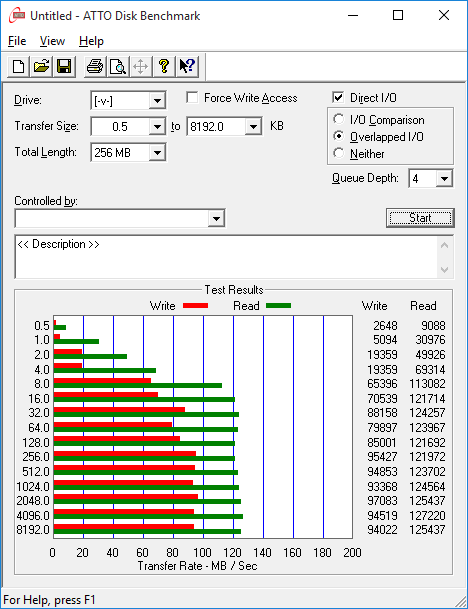 Later on, I used the 4TB with the test bench that has an SSD system drive and found the performance gap to be bigger (as expected) but it goes to show that WD’s claim depends on how the SSHD is being used. ‘SSD-like’ is pretty subjective so it is important for people to have realistic expectations. As a boot/system drive, the Blue SSHD is good but it isn’t going to match or beat an SSD – but it’s closer than a traditional HDD has a much better $ per GB ratio than a SSD which results in a fantastic compromise. We’ll go through the specifications first, then validate our tests unit against them to see how the SSHDs perform against a WD Green 2TB HDD and a Samsung 1TB 7200rpm HDD. 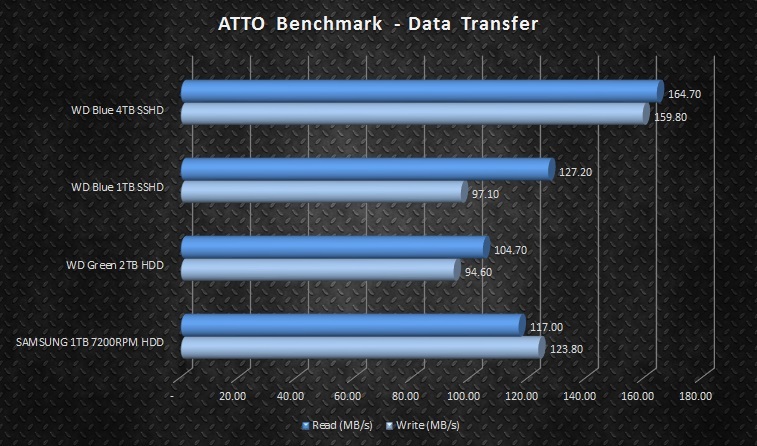 I ran the WD BLUE 4TB and 1TB SSHD review samples through their paces with ATTO, AS SSD, and Crystal Disk Mark to get some metrics for comparison against the specifications. 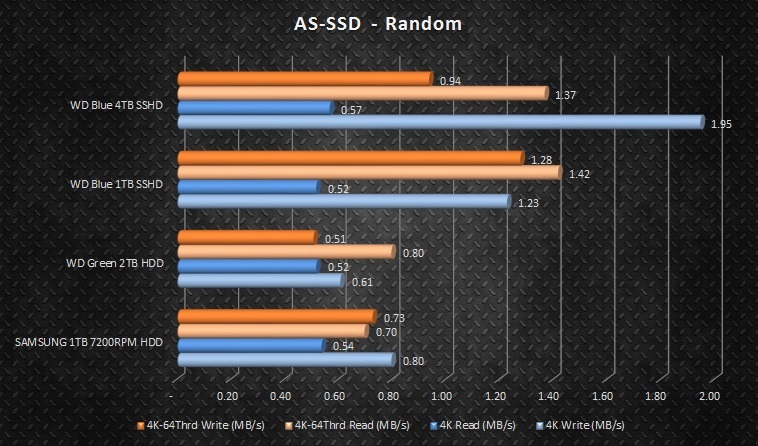 As a comparison, I also tested a Samsung 1TB 7200rpm HD103SJ and a 2TB WD Green 5400rpm mechanical hard drive. The Samsung HDD is a relatively quiet drive at 7200rpm and has been a solid performer over the past couple of years so it’s a good comparison as this is typical of what many people may currently have. The WD Green 2TB is a very quiet and cool drive and runs in competition with the BLUE SSHD from a capacity and noise point of view. 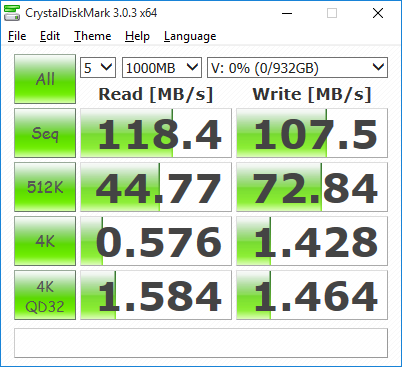 I wasn’t sure what to expect from the WD Blue SSHD but I was expecting it to be faster than the Green 2TB drive without the NAND – and indeed it was. 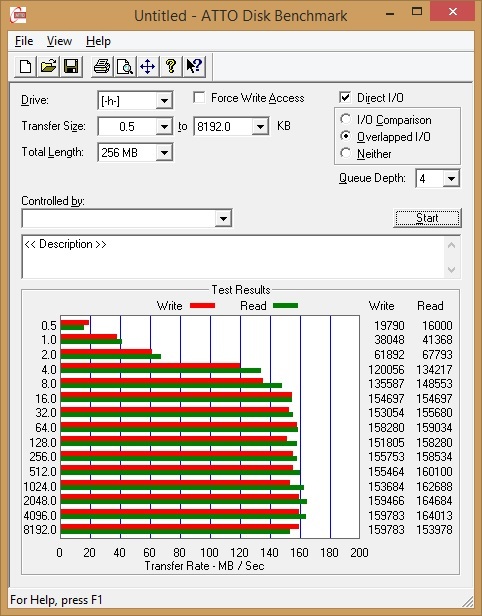 The Samsung 7200rpm HDD was also found wanting in comparison and although it is an older drive, I hadn’t expected the performance gap to be as big as it was in the sequential testing. 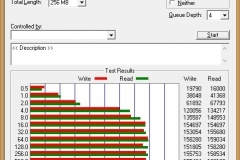 When running the 4TB version through the ATTO tests with compressible data, it exceeded the specification of 150MB/s by hitting 164.7MB/s (read) and 159.8 (write). The 4TB version was 41% faster on the read test and 29% faster on the write test than the Samsung drive I used for comparison. 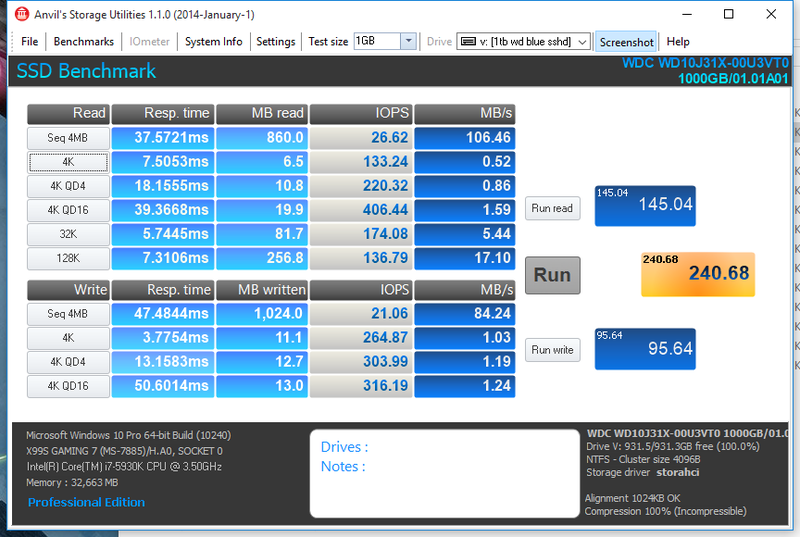 The 1TB 2.5″ SSHD managed 127MB/s on sequential compressible reads and 97MB/s on the writes. Whilst not as good as the 3.5″ 4TB Blue SSHD, it was faster than the 2TB WD Green and also faster on the reads than the Samsung 7200RPM 1TB drive we used for comparison. Again, we saw the specifications under more pressure in our incompressible data transfer speed tests. 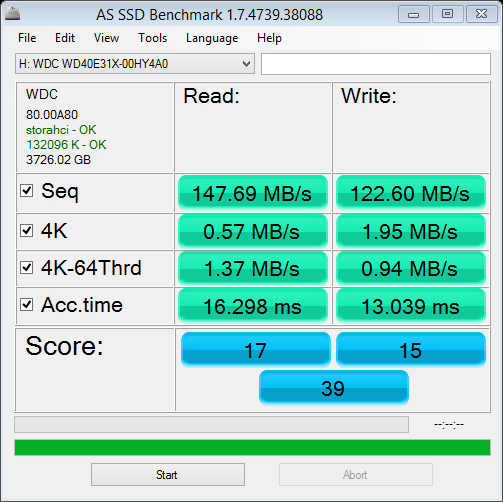 The WD Blue 4TB SSHD fell just short of the 150MB/s target in the AS-SSD read test with a respectable 147.69MB/s and 122.6 on the write test. 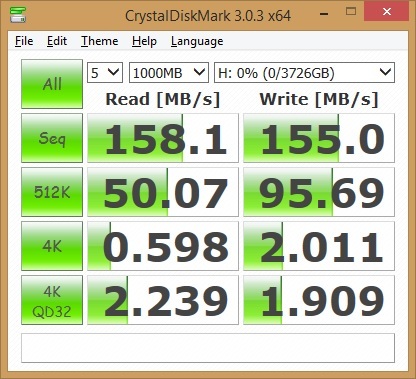 The result with Crystal Disk Mark was more aligned with the specification with the drive hitting 158.1MB/s on the read and 155MB/s on the write test. The 1TB SSHD scored some good results for its form factor and went toe to toe with the Samsung 7200rpm desktop drive despite having a much lower spindle speed. 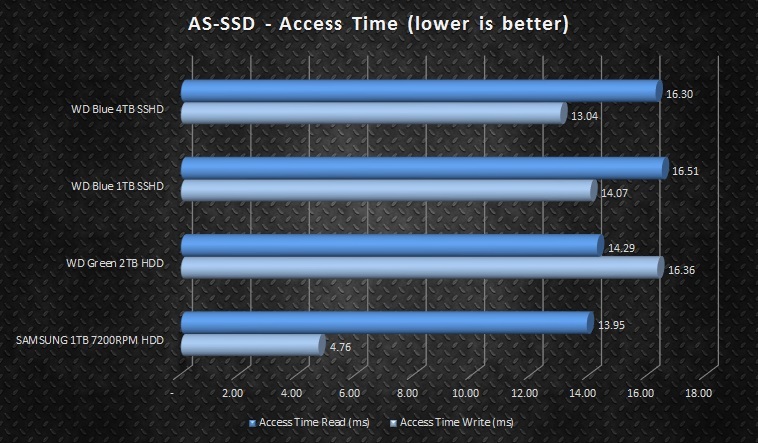 In all testing, the WD Blue SSHD came out ahead of the Samsung drive – with one exception being access time. Surprisingly, the access time on the Samsung was better than the WD Blue. When it comes to the comparison to the WD Green 2TB option the WD Blue was more dominant than I expected. Both drives share the same 5400rpm spindle speed, both make very little noise, both run cooler than faster 7200rpm drives and both have little to no vibration. In terms of performance, these are very different products. Overall the Blue really demonstrated the difference between an ‘eco’ Green storage drive and a mainstream system drive. It’s significantly faster across the board, hence why you pay a little extra for it. These results show that you can upgrade bulk storage to 4TB and get a boost in speed at the same time over an older 7200RPM drive. These speeds are pretty good and make a worthy upgrade path. 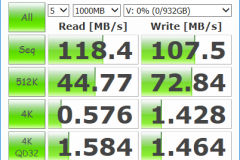 For real world testing, I switched out the 1TB 7200rpm ageing Seagate Barracuda from the test bench and copied the data across to the 4TB WD Blue SSHD and went about normal tasks. The first thing I noticed was how quiet it was, for a minute I wondered if I’d forgotten to plug it in, then I saw the volume appear in Windows. Loading games from the Steam library was notably faster as well. This could have been the transfer times at work or it could have been that the older 1TB drive I replaced didn’t have much space free. 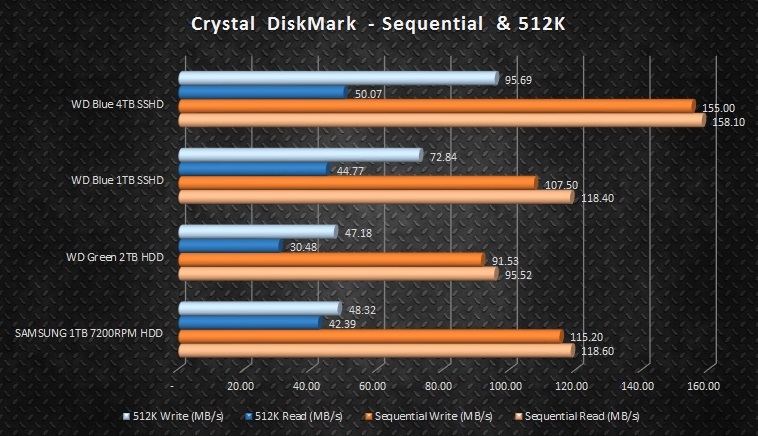 Either way, the upgrade from a 7200rpm ‘fast’ drive to the 5400rpm SSHD really felt like an upgrade. 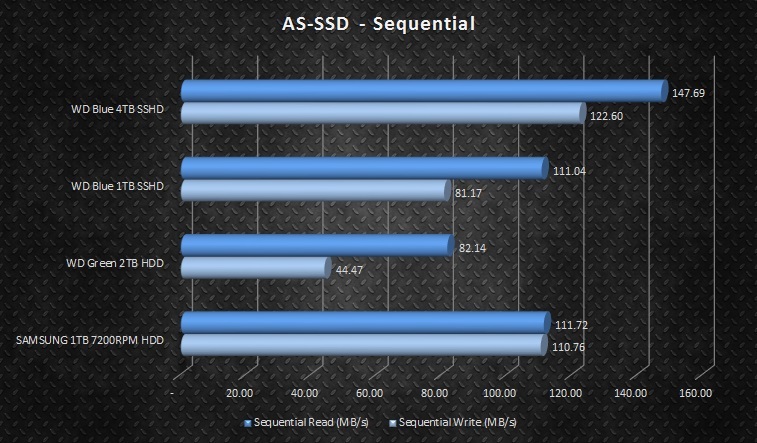 If I’d purchased the 4TB WD Blue SSHD with my own cash, I’d be feeling pretty happy about it. With a LAN event approaching, we were building a pair of systems for the event to showcase some other hardware plus the Aussie titles Submerged and Satellite Reign. If you haven’t checked out either of these games, head over to Steam and get on board. We installed the 1TB version in each of the concept builds showcased on the Fractal Design booth at RESPAWN LAN last month (September, 2015). In both cases, the WD Blue drive was the applications drive and paired with an SSD boot drive and performance was pretty good for the libraries that were not on the OS drive. One build included an overclocked Pentium G3258 @ 4.2GHz with 8GB Kingston HyperX Fury DDR3 and a HyperX Fury 240GB SSD. The WD Blue was mounted for high visibility in the Fractal Design Node 605 HTPC case which meant that gamers could literally feel the temps and lack of vibration. The theme of this build was budget gaming in a HTPC case. Airflow was important because we had the challenge of a heavily overclocked CPU and GPU to keep cool but in a HTPC setting we also wanted low noise. To maximise the airflow, we removed the drive cages and went with less conventional mounting for the SSD and hard drive. In this situation, the 1TB WD Blue SSHD was perfect, operating silently in the corner of the case without adding any real heat to the case. The rig had space for a modest media library and a typical gaming library. The other system was a more high-end mini ITX setup with an i5-4670K cooled by a Noctua NH-L9i cooler, 480GB ADATA XPG SX930 SSD, 16GB XPG V1 DDR3 in a Node 202 slim-line chassis. This is where the 1TB 2.5″ drive really shines because the case only has 2×2.5″ drive bays without any noise/vibration dampening measures in the drive cage. There was also the cooling aspect to consider in that the Node 202 by default doesn’t have any active cooling. The CPU we selected was pushing the Noctua specifications of the CPU cooler’s TDP rating and we also had a high end GPU in the build. The last thing we wanted was another heat source in the drive bays. 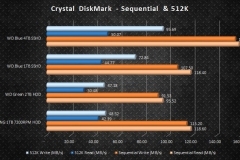 The WD Blue 1TB SSHD operating at 5400rpm gave us the lower acoustic profile and less heat to manage but still yielded the performance we were looking for. The end result was a very quiet console sized PC. Even when copying the Steam library across the network, the hard drive activity noise was inaudible in the living room. In our Node 202 concept build, we only had room for 2×2.5″ drives – if more internal storage was required for use as, say a media PC with TV Tuner and iTunes Library, pairing a 1TB Blue SSHD with a slower 2TB 2.5″ HDD for a total of 3TB of space would be a good result. 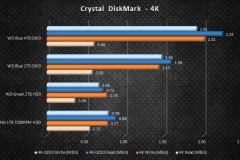 The 1TB SSHD is also a good option for a notebook upgrade in a mainstream user scenario. Enthusiasts will always have at least one SSD in their systems and usually a 7200 rpm enthusiast level hard drive like a WD ‘Black’ as well. Based on what I saw in the testing of the 4TB SSHD and the pair of 1TB 2.5″ drives, this is the future of mechanical hard drives and a great compromise of noise, heat and vibration for performance. 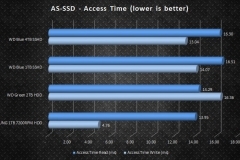 The WD Blue SSHD 4TB model can be found online as low as AUD$259 and the 1TB version for $129. 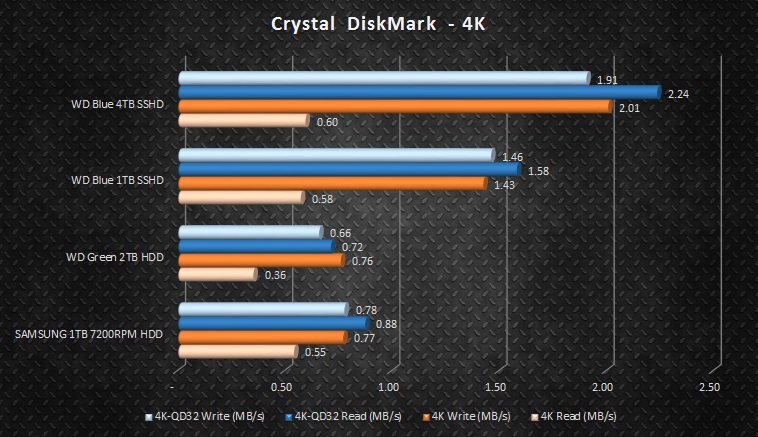 This seems reasonable for the performance that you get and fits with the upper end of the mainstream components. In comparison, a 4TB WD green drive retails for around the $205 mark but I wouldn’t be using one of these as a system drive – the versatility is worth extra ~$50 as far as I’m concerned. The 4TB WD Black is $50 more expensive than the Blue SSHD so it really is priced to provide a practical middle option between the two. If you use one of these Blue SSHDs as a system drive and expect it to rival a 500MB/s SSD, you will be disappointed but for a mechanical hard drive, this really is a great unit and a worthy upgrade for 1TB/4TB of storage space. The NAND element of this drive is invisible to the user. For all intents and purposes, the WD Blue SSHD is like a normal everyday hard drive in terms of installation, formatting and general use. There are no special drivers, management software or tools required and you don’t need to treat it differently to other hard drives. The WD data migration software available for download from the WD website works a treat and we didn’t have any issues at all with the three drives that we installed on the test bench and 2 showcase builds. The 4TB Blue SSHD will replace the 7200rpm drive in the X99 test bench because it makes a lot less noise which is important when testing CPU coolers and graphics cards where we listen for fan noise or capacitor whine. We also noted that the 4TB Blue was faster than our other drive with greater capacity so it’s a no-brainer to add this product as an upgrade to the test bench moving forward. At the end of our testing period, I couldn’t be happier with both 4TB and 1TB drives and wouldn’t hesitate to use the WD Blue SSHD in my personal systems. Whilst personally I will always use SSDs for boot drives in gaming rigs and workstations, I’d seriously consider a Blue SSHD for a HTPC or as an upgrade to a laptop with only one drive space available. 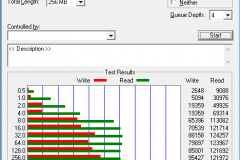 NAND management/logic is seamless – no tweaking required. Suitable for a boot drive for an entry level system, HTPC or single SATA drive Laptop.